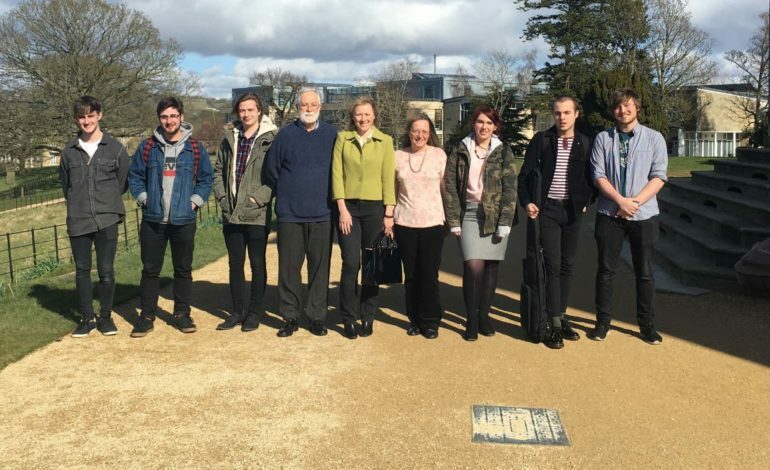 A donation of £348,000 has been awarded to Bath Spa University by two charitable funds, the Doris Southcott Bursary and the Taunton Maids Bursary, both set up by the late Marian Doris Southcott. Mrs Southcott, who lived in Taunton and passed away in 2005, requested that her estate be equally split between two educational bursaries, specifically for young people who come from Somerset, North Somerset, and Bath and North East Somerset, and who study subjects that were close to her heart – music, textiles and fashion design. To date, the University has received £548,000 from the charitable funds, including £200,000 which was donated in 2016. As a result of the funding, students aged between 18 and 25 from the region who are enrolled on a music, textiles or fashion design related degree at Bath Spa University will be able to apply for bursaries to help them pursue their passion for their chosen subjects. The Doris Southcott Bursary is in memory of Mrs Southcott’s late mother who had a great interest in fashion and textiles. The bursary will help budding fashion and textiles designers at the University to hone their craft, purchase essential course materials and display their work at self-funded end of year degree shows. Louise Pickles, Course Leader of Fashion at Bath Spa University, said: “We are extremely grateful for the generosity of Doris Southcott. “In addition to materials and equipment, fashion design students have to fulfil costs for creating portfolios and promotional materials, as well as photo shoots, accessories, models, and fashion show expenses. The Taunton Maids Bursary is in memory of Mrs Southcott’s domestic cleaning business and in honour of her loyal staff. This bursary is specifically for music students and reflects the pleasure she derived from it. Roger Heaton, Course Leader of Music at Bath Spa University, said: “From classical music and jazz to musical theatre, opera and world music, our students require a range of instruments to complement their learning. Wendy Cryer, Chair of Trustees for the Marion Doris Southcott scholarships, added: “The trustees have been impressed by both the professionalism and care Bath Spa University has shown in the way it has administered student bursaries on behalf of The Taunton Maids Bursary and The Doris Southcott Bursary. “We feel that by partnering with Bath Spa University in this way, we have been best able to fulfil the aims of both charitable trusts. Eligible students for the bursaries will be aged between 18 and 25 who come from Somerset, North Somerset, and Bath and North East Somerset. In order to receive the Taunton Maids Bursary, students will study BA Music, BA Commercial Music and BA Creative Music Technology, or postgraduate courses; MMus Songwriting, MMus Performance, MMus Composition and MMus Creative Sound and Media Technology. To receive the Doris Southcott Bursary students will study Fashion Design and Textile Design for Fashion and Interiors.